Make an Impression with Colorado Convention Gifts – Then Take in the Sites! Colorado is a huge center for conferences and special events and if you find yourself hosting or exhibiting an one, then it’s important to make the right impression. 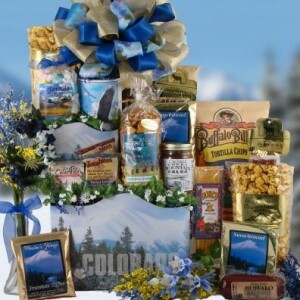 At BisketBaskets.com, we can help you bring the Colorado experience to your clients through our great selection of Colorado convention gifts. Filled with gourmet treats that celebrate all of the best flavors of the Rocky Mountains, our Colorado convention gifts are perfect for welcoming special attendees and clients to the event while ensuring they’ll remember your name. But what do you do once you’re done with the event? Where can you go to entertain clients or to spend your free time? Let BisketBaskets.com be your guide with these quick travel tips for Colorado conventions. We’ve gathered together some of the favorite Colorado destinations and provided them to you in a quick and easy list so that you can take in all of what Colorado has to offer. If you find yourself in any of these cities, be sure to check out our favorite attractions! Denver: As Colorado’s capital and largest city, Denver is full of possibilities for the conference goer. Check out some tourist favorites like the Denver Zoo, the Downtown Aquarium, the Denver Art Museum, Elitch Gardens amusement park, the Denver Museum of Nature & Science, the Colorado History Museum, the Buffalo Bill Museum and Gravesite, the Cherry Creek Shopping District, or the Coors Brewery. Colorado Springs: This Colorado destination has plenty to see and do during the off-hours of your conference or event. Explore attractions like the U.S. Olympic Training Center, Colorado Springs Pioneers Museum, the Cave of the Winds, Old Colorado City tours, the Colorado Wolf and Wildlife Center, the Rio Grande Scenic Railroad, and the Cripple Creek casino. Aurora: Planning a trip to Aurora for a conference? Then be sure to take in some of the city’s best attractions and sites, such as the East End Arts District, Plains Conservation Center, Aurora Fox Arts Center, the Morrison Nature Center and Star K Ranch, Eisenhower Suite at Fitzsimons, Saddle Rock Golf Course, and the Quincy Reservoir. Fort Collins: This Colorado city offers ambiance, art, dining, entertainment, shopping, outdoor recreation, and more. Visit sites and attractions like the Anheuser-Busch Tour Center, the Great Stupa at Shambhala Mountain Center, Observatory Village, Rocky Mountain Raptor Center, Fort Collins Museum, The Gardens at Spring Creek, and Mountain Whitewater Descents, a favorite whitewater rafting adventure. Pueblo: The Pueblo Ice Arena, Union Avenue Historic District, Walking Stick Golf Course, Sangre de Cristo Arts & Conference Center, Historic Arkansas Riverwalk of Pueblo (HARP), and Pueblo Zoo are favorites of both tourists and locals. Be sure to check them out when you’re in Pueblo for an event. Boulder: This lively and entertaining city has much to offer any conference goer. Check out the Eldorado Canyon State Park, BoulderMuseum of Contemporary Art, National Center for Atmospheric Research, Pearl Street Mall, Dushanbe Teahouse, Chautauqua Park, Boulder Falls, Celestial Seasonings Tea Company, and the University of Colorado campus. Aspen: This skiing hot spot has tons to see and do, including numerous walking tours, the Wheeler Opera House, Aspen Center for Environmental Studies, Smuggler Mine, Aspen Art Museum, Anderson Ranch Arts Center, the Aspen Club and Spa, Rio Grand Trail, Rio Grand Skatepark, and two pedestrian malls. Remember, all of these destinations have nearby hiking, fishing, camping, skiing, and outdoor sports activities too! Having Fun With Playful Pooch, Denver Dog Boarding! We’re all about supporting other Colorado businesses, especially ones working for the good of our furry friends! Playful Pooch is a dog daycare and dog boarding center located in Denver, CO. With over 7,500 square feet of indoor and outdoor dog care and training areas and one very talented and friendly staff, you know your pooch will have quite the smile on his or her face! The staff absolutely loves dogs, so you can rest assured knowing your dog is in good hands while you’re out-of-town. They’re even a member of the Pet Care Services Association, with various-sized kennels so both small and big dogs will be so comfortable. Your dog will feel just like he or she is right at home! We’ll hope you’ll visit the Playful Pooch site and take a look around, and perhaps board your dog there the next time you’re out of town. Talk With Us On Twitter! There may be other gift baskets sites out there (BisketBaskets.com is the best! ), but how many actually allow you to talk with a real person, discuss gift ideas, and take the time to find the right gift baskets for everyone on your gift list? We do! We’ve recently expanded our online presence to include Twitter.com – a site where you can sign up in less than 2 minutes, create a quick profile, add some “followers”, and start chatting with us! 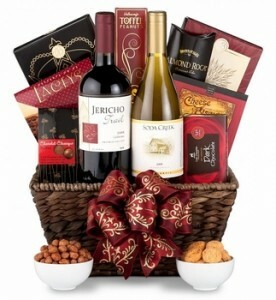 We’re located at Twitter.com/BisketBaskets – feel free to say hello, ask us gift questions (the harder the better! We can handle it! ), and help you easily navigate through the holiday shopping season. This festive season is meant to be spent with your friends and family, not tearing your hair out at the mall! Come by and say hello at Twitter.com/BisketBaskets! This Christmas, take your sweetie on a holiday trip she’ll never forget. The Rocky Mountains are simply breathtaking, and make for a wonderful romantic getaway destination. Colorado holds a wide variety of activities to enjoy, including unparalleled skiing and snowboarding, delicious restaurants, and fantastic entertainment. Get snowed in this winter with the one you love as a special gift. Snuggle up with a blanket before the fire, play in the snow, and dine finely on your romantic getaway. Start off your trip the right way by sending a surprise gift basket to your hotel room, cabin, or bed and breakfast. This welcome will start the trip off with a feeling of romance and serenity. These Colorado Gift Baskets feature yummy snacks and treats in souvenir containers. Attach a hand written message for an extra special touch. BisketBaskets.com offers hand delivery options for any hotel in the Denver, Colorado metro area, or in Colorado Springs. If you’re looking to surprise your sweetie at a cute little bed and breakfast, BisketBaskets.com will ship your gift basket beforehand. Walk into your serene mountain retreat with a welcome that’s warm and inviting.